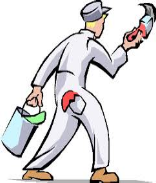 Quality Commercial painting and decorating services carried out by our own painters and decorators competitively priced and completed on schedule - everything a commercial client needs. We offer a highly flexible service and work in all types on environment. We undertake commercial and industrial projects ranging from small shops, units or offices to hotels, prisons, hospitals, factories and warehouses across the South West. The appearance of the interior commercial property is just as important as the exterior appearance of your business !!. If you regularly have clients in your office, it is of the utmost importance to have a clean and professional looking environment , Simply applying a fresh coat of paint can completely change the way your office looks . It is very important to maintain a professional work environment for your employees !!. If the walls of your office, retail unit are dull and cracking, this might inspire a less than professional attitude with your staff,They may also work much less efficiently. When potential new customers are concerned, nothing is more important than the image you project to the public. We can work to clients' Schedule of Works and Schedules of Dilapidations.A high quality and professional service is essential to us and we are careful to employ fully qualified and well experienced decorators many of whom have worked with us for years. As members of the Painters and Decorators Association and a recognised Contractor you can be assured of the highest standards in work, safety and service. Free quotations are available following site visits or from scaled plans. Contact us for a site visit and quotation. Keeping your business premises in good condition is vital, whether it’s to present an appealing image to potential customers, or provide a vibrant, productive environment for your employees to work in.